Happy Sunday! It felt only appropriate to continue with my Sick Tings posts throughout Blogmas, so, here we are, welcome back. For those of you who are new around these parts, Sick Tings is essentially just an entire week squished into one photo collage with a load of my rambling written underneath posted here on becc4.co.uk. This week has been rather busy, as always, so let's get into it. The week started with my usual uni commitments, lectures, societies etc including a huge bombshell from one of my lecturers. We have been working on a group project for weeks now and it was only this week that we met him and he told us that we've been doing the totally wrong thing for our project. Oh, and it was due this week. Fun, fun, fun. Thankfully, the majority of our group were free that afternoon so we just spent the day smashing that out. You'll be pleased to hear that we managed to get it finished and submitted on time, so now all that's left to do is present the project to the entire module on Tuesday afternoon. But other than that, it's all sorted and all is good with the world once again. On Tuesday evening I met my parents for an IKEA trip and dinner (perks of going to a uni close to home) and it was lovely. I picked up a few bits, but I was actually lowkey disappointed with their Christmas offerings this year. Maybe it's still a bit early and the best bits are yet to come. We went to Franco Manca for a pizza afterwards and it was as delicious as ever. Not an awful lot happened Wednesday or Thursday, just the usual uni stuff, but Friday was a good day. 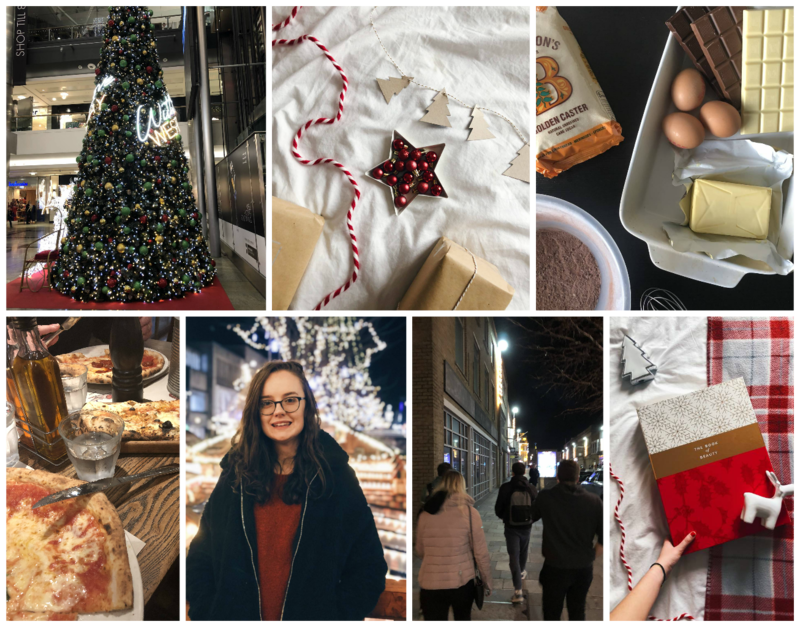 I spent the afternoon doing some last minute Christmas shopping and then attended an event in the evening with the Sotonbloggers. We were invited down to the Christmas Market in town to experience all the festivities. We ate crepes, chocolate coated strawberries and German sausages, drank mulled wine, and wandered all of the stalls. It was a really nice evening, so if you haven't been to the market yet, I definitely recommend doing so. Now, my friends and I were meant to be going to Nando's afterwards for dinner but we just couldn't get our peri peri fix for love nor money. There are three Nando's in town; one was fully booked with people queueing out of the door, one shuts at 8pm and so wasn't let new customers in, and the other had had a powercut. Nightmare. By this point, it was about 8.30 on a Friday night, and unsurprisingly all of the restaurants were packed. So, we ended up going for an Indian at our local drunk food/midnight curry house. The food there really isn't great, and it was only going sober that we realised just how bad it was. It was really nice to hang out with my friends though, even if the food left us all feeling a bit dodge. I've just spent this weekend planning, photographing, writing and scheduling my Blogmas content and I'm really pleased with how it's all coming together. There are going to be all sorts of festive things coming your way over the next few weeks and I can't wait for you all to read them. This evening I'm going to cook myself another roast and get ready for my penultimate week at uni before heading home for Christmas.